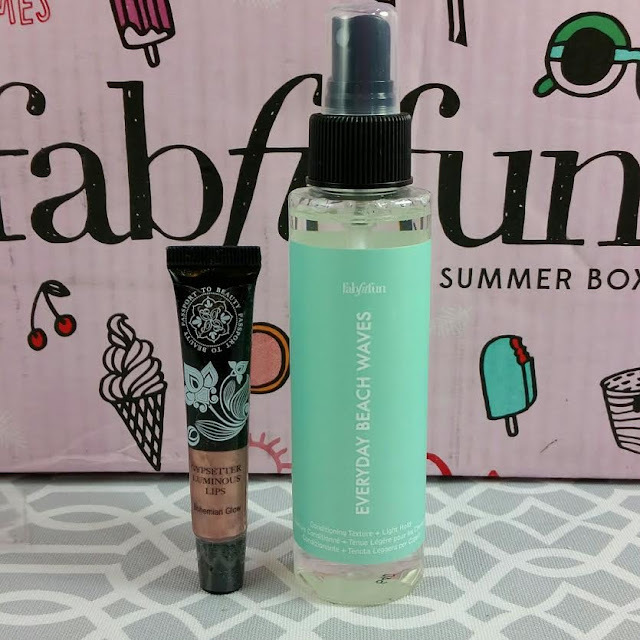 This review is for the FabFitFun Summer 2016 box which is still available. So if you love it, you have a chance to snag one still. Fabfitfun is a lifestyle subscription box that ships out quarterly. Each box has items relating to beauty and skincare, makeup, home items and fitness focused products. It's a lot of fun because you usually won't find these items in any other subscription boxes. Every box comes with an informational pamphlet detailing what you've received. There's also usually a few bonus (or sponsored) items as well. I realized after I put up this photo that I forgot that stuff AND one of the products. Whoops! I'll have to rectify that later. Stemulation Daily Micro Derm Scrub- This exfoliating scrub is made with aloe and diatomaceous earth. I'm not sure if I would use diatomaceous earth on my face. We'll see how it goes. Otherwise I'll use it on the rest of me. Osea Atmosphere Protection Cream- What a strange name. I thought it was going to be an SPF of some kind but it's not. It's just a moisturizer with shea butter. It has lavender in it so I can't use it but the booklet says it has a matte silky finish, makes a great base for makeup application or can be blended in with your liquid foundation for extra moisturizing oompf. Passport to Beauty Gypsetter Luminous Lips- I received this lipgloss in Bohemian Glow. It's pretty sheer so it's basically my own lip color. It's quite sticky but definitely moisturizing. It's made with Vitamin E and antioxidants. Trina Turk Canvas Tote- This is a super handy, pretty large tote! It's made of sturdy weight canvas and will probably last forever. I'm in the mood for loving totes now that the city next to me instituted a plastic bag ban. It even has a bottom, just the way I like! Summer & Rose Yoga Towel- There are three versions of this towel and I received the blue one with "More Happy, Less Worry" on it. There's also an orange one with "dream big" and a purple one with "good vibes" on it. 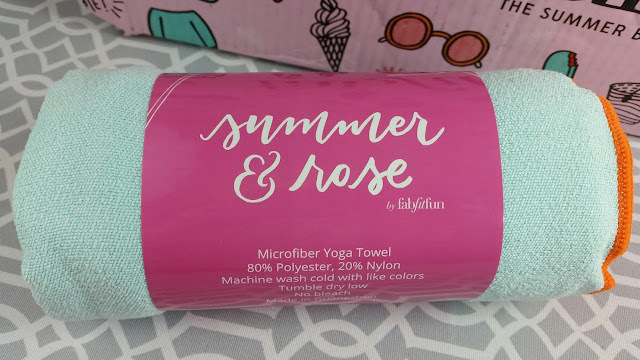 This is a moisture wicking towel and while it's supposed to be used on a yoga mat, it's also a nice size for setting out to lay in the sun. Wish I'd had it over the weekend! 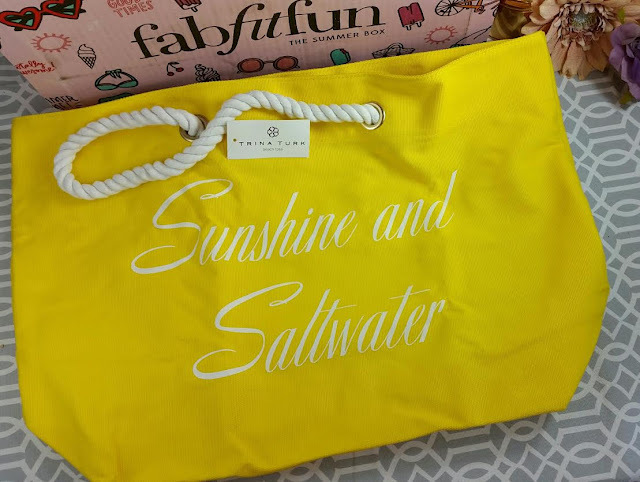 This is also a Fabfitfun branded item. That makes for a total of three in this box. Betchsicles Ice Pop Molds- Here's what I forgot in the original photo. 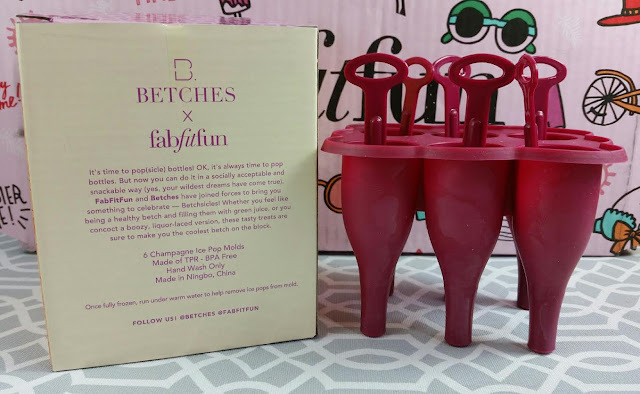 These are a collaboration between Fabfitfun and Betches. I have no idea what Betches actually is, though. It appears to be a website that prides itself on... having no restraint? Being unapologetically crass? In either case, it's not very entertaining and they do appear to have a shop that sells silly shirts and phone cases. Do I seem negative? 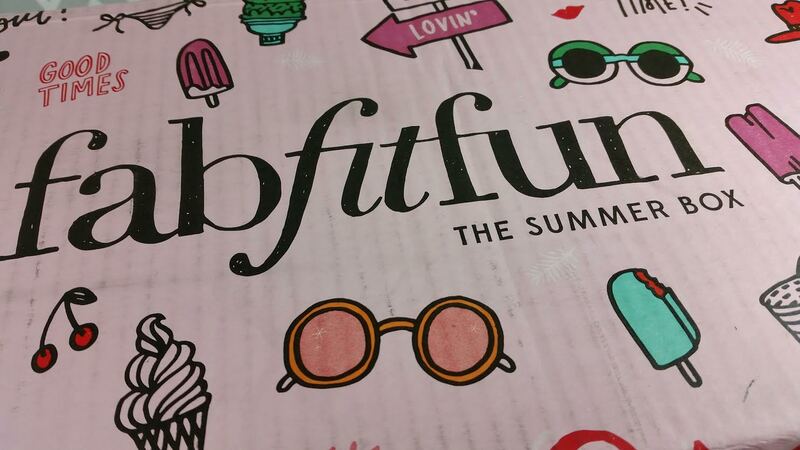 It's mainly because I'm tired of seeing Fabfitfun branded items in boxes. These are champagne bottle shaped popscicle molds. It's possible I may get the urge to use them but it's highly unlikely. They're cute yes, but the "retail price"? Yeah, right. Bonus Items: Also included in the box is a foil sample of Burt's Bees BB Cream (two in my case, although one was actually supposed to be a Cleansing Oil) and a Compeed blister relief patch. VERDICT: This box actually has an excellent composition for a Summer box. 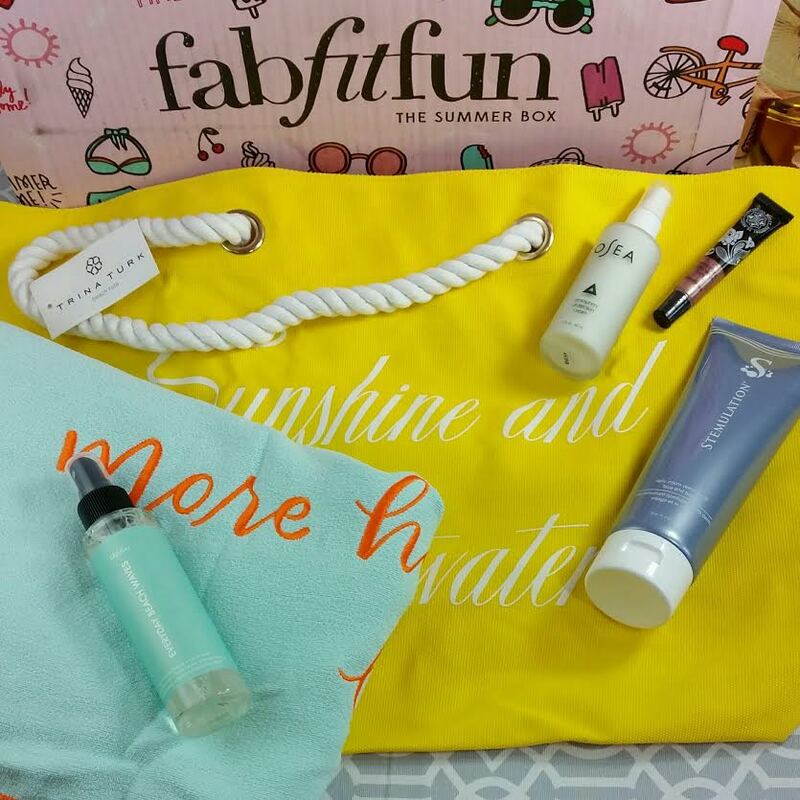 Tote, blanket, popsicle mold, beach spray... Plus an exfoliant which works great with a self tanner and a moisturizer. 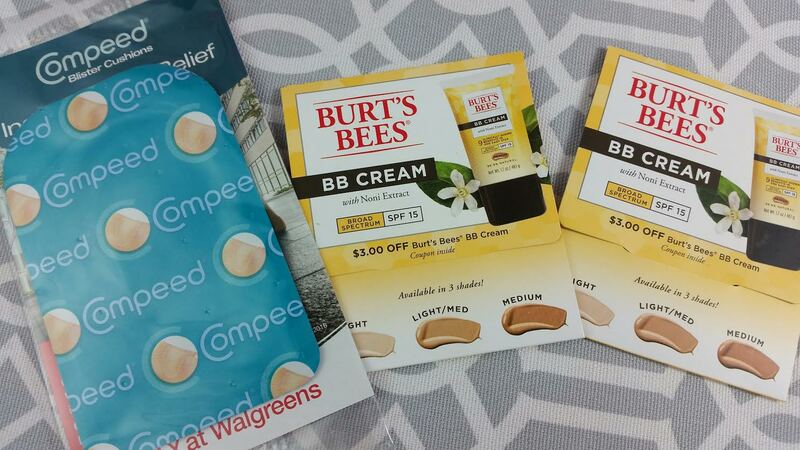 I'm bummed about being allergic to the moisturizer but I'll be using almost everything in the box. The only thing I don't like is the Fabfitfun branded items. Past branded items have been cheap and broke quite easily (anyone remember that fruit infuser bottle? it broke as I opened it!). Maybe I'm too obsessive? Does anyone else even notice what they're doing sneaking in all the super cheap FFF products? Or am I just waaaaay too picky? If you would like to sign up for FabFitFun, you can do that here. Use this link to get $10 off your first box. What did you think of this box? Love it, hate it? What's your favorite thing? Mine is definitely the tote! This is the first FFF box I've disliked strongly enough to open, see all the ORANGE, close and feel utterly and totally used. 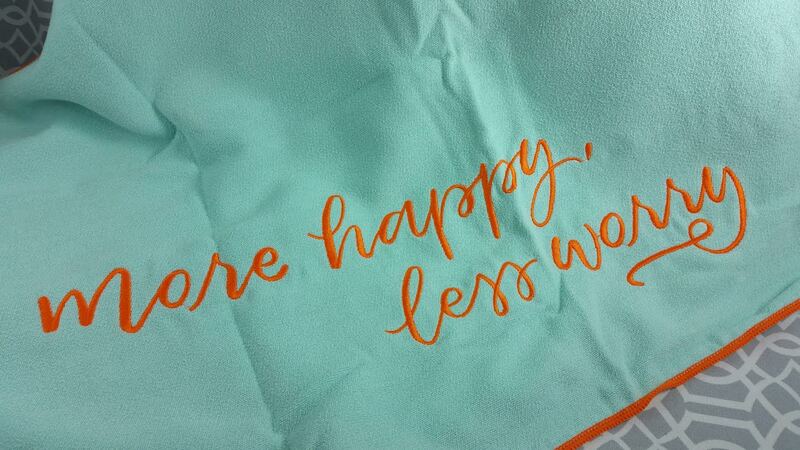 WHO on earth wants an orange ( bright traffic cone orange) tote bag and towel? Just paint stripes down my center with sunscreen and I'm the Highway Woman. I'm sorry but unless there had been some really beautiful and useful item in this box, and there wasn't, all I can see are traffic cones. I think they PUNISH the people who don't have the funds to buy a yearly subscription and pick the GOOD colors. You got really good colors. I think they're like Popsugar in that respect. They started as a website (gossips) and branched out. I don't frequent the website but I'm pretty sure it's like that. But when they started they had Guiliana Rancic's (sp?) name attached to it. She's been gone for awhile, though. This is an expensive box so I feel like they should be able to snag some great things. Popsugar manages it every single month! We'll see, I guess. I don't mean to detract from the joy and light that are your reviews, but they charged me for a SECOND box while I wasn't paying attention and it came yesterday. Another orange beach bag, but the towel you got. Also, a prettier pink lip gloss than the " brown" that goes with my " orange. I called, threatened a chargeback, which scares all the sub boxes, and they are taking the second one back and refunding me. This is about the 5th time in my history with them that they've done this!! I am NOT kidding. IF anyone reading this EVER closes an account with them and opens a new one for some " perk", be very vigilant. They will charge you under every possible combo of names and email addresses. It backfired so hugely on me, it's not funny. If any other sub charged someone 4-5 times on a closed, verified closed account, the anger would be massive because of this box's cost. I WOULD unsubscribe totally and forever, but then I remember..I may resign but I never truly leave their computer system. PS- I kept the pretty dark pink lippie, because of the hassles of it all. And I don't feel extremely guilty. They previously had the absolute worst website interface for their subscription. The WORST! And they do have emails that prey on those who don't read the small print. I clicked a "Get Deal!" button in one of their emails and it charged me instantly for a full year! No "confirm" or "is this your shipping address"-- nothing! They refunded me without issue but that is a deceptive practice, imo.